Since Makyve Diva’s historic third Melbourne Cup win last Tuesday, comparisons have been made between the mare and that other horse racing legend Phar Lap, whose story was brought to the big screen in 1983. The ‘Red Terror’, as he was later titled, won 37 out of his 51 races, including the 1930 Melbourne Cup, but what made him so adored by the Australian public was that he represented hope in a time when there was very little. The Great Depression had forced 30% of all workers out into the streets. Those few with any loose change often placed it on Phar Lap and he rarely let them down. 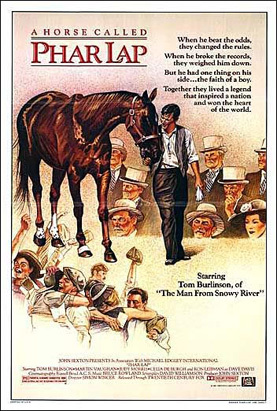 The key to the chestnut gelding’s success lay famously in the relationship that he had with his strapper, Tommy Woodcock, played by Tom Burlinson fresh from his starring role in that other horse epic The Man From Snowy River. Woodcock, who is featured in an audio interview with director Simon Wincer in the DVD extras, was critical of Phar Lap’s trainer, Harry Telford (Martin Vaughn) for working the beast too hard and there are some spectacular slow motion shots by cinematographer Russell Boyd (Master and Commander) of Telford riding the horse up near vertical sand dunes as part of his punishing regime. Lured by the promise of untold riches in a race at Agua Caliente on the Mexican border, Phar Lap travelled to the States in 1932 accompanied by Tommy and owners Dave Davis (Ron Leibman) and his wife Bea (Judy Morris bringing a refreshing blast of femininity). Then, sixteen days after winning on the harsh desert track, Phar Lap died in the arms of Woodcock, a victim of arsenic poisoning. The name Phar Lap means ‘lightning’ in Thai, and in a weird twist of fate, the horse that played him in the film, Towering Inferno, died of a lightning strike some years later. But unlike his character, there was little concern over his remains. Phar Lap, on the other hand, had his hide stuffed and put on show at the National Museum of Victoria – he’s now at the Melbourne Museum. His heart went to the National Institute of Anatomy in Canberra while his skeleton went to the Dominion Museum in New Zealand. Whether Makyve Diva will endure a similar dismemberment upon her death is unclear but she can now enjoy a peaceful retirement…..unless, of course, she is cast to star in the cinematic story of her own glorious career.